Alums, bands, classes, dancing, excitement, fireworks…From A to Z, Reunion 2009 had everything to offer the 700-plus alumni and alumnae and their families. On Friday, the rest of the retuning classes arrived and had their choice of activities-from campus tours and Seneca Lake excursions aboard The William Scandling research vessel, to poetry readings or just catching up with old friends, there was something for everyone. “I came back to check out what was going on, and to see some old friends,” said Edward S. Lansing ’43, of Florida, at the Deans’ Welcome Luncheon on Friday afternoon. Friday evening, after happy hour at the Oaks Tent, President Mark Gearan and his family hosted the 50th reunion class of 1959, while the remaining classes gathered on the Quad for the International Buffet Dinner, to eat, drink, laugh and remember their fondest times at HWS. After dinner, alums gathered in Houghton House, where, in addition to jazz from renowned musicians and alums Bob Masteller ’60, Al Scheeren ’60 and Steve Venuti ’61, the Clarence “Dave” Davis ’48 gallery was dedicated. Saturday morning was chock full of activities, including Alumni/ae College sessions such as “Extinction 101” and “The Economics of Baseball,” before the annual alum parade, which took alums up Pulteney, down St. Clair and through to the Quad for lunch and the President’s Reunion Forum. At the Forum, representatives from the 10 returning “milestone” classes, the 50th PLUS-ers and the new graduates of the Classes of 2009 gathered on the Quad before alums to present Gearan with checks for gifts to the Colleges totaling more than $14.5 million. Alumni/ae citations were also awarded, as were the Young Alum Awards and a Lifetime Service Award, which was presented to Eric Hall Anderson ’59. After lunch, alums enjoyed open houses at the Finger Lakes Institute, the Salisbury Center for Career Services and the new Centennial Center for Leadership and served as admissions officers for a day. By 2 p.m., hundreds of alums made their way to the Quad, the heart of Reunion 2009, where Family Festival, the Finger Lakes Wine Festival and other activities were in full swing. 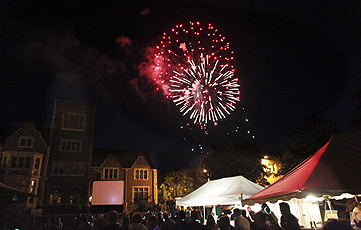 By the time the sun had gone down over the Quad, fireworks were coming up, bursting in full color above Coxe Hall. The fireworks finale kicked off a set of rocking tunes from Brass Taxi. The group performed covers from across decades, everything from “Superstition” to Beyonce’s “Crazy in Love.” Sporting neon glow sticks, alums danced the last night of Reunion away together. In the morning, a few brave alums met up on the steps of Scandling Campus Center for an early morning run, and later, everyone said farewells over breakfast on the Quad and recalled some of their favorite memories during the weekend. Click here to enjoy more Reunion stories and photos.